Today and yesterday, I took off work for my birthday. Everyone should take off work for their birthdays. 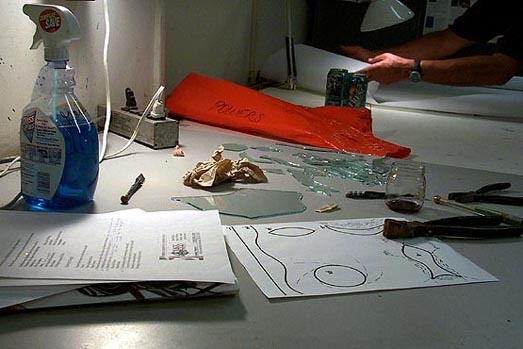 I went to the Art League School at the Torpedo Factory to try, yet again, to register for their stained glass classes. This is something I've been wanting to do for a year and a half now, but I've learned the classes fill up really fast. I thought I was registering early enough for the fall quarter by going in today, but no such luck: the Monday night class I wanted was full. I left them a check in case a spot opens up, or in case they open up an "overflow" class later on. I really would like to get in this quarter; my understanding is that they teach lead-came stained glass, as opposed to copper-foil, during the fall, and lead is what you'd want to do window type things with. Ever since I started talking about taking this class, Don has been dropping hints like boulders about doing some pretty transoms for the first floor of our house, and I guess that's a window type thing. We'll see. Fingers crossed. Got a call from the Art League wanting to know if I was available for Tuesday night classes. I said yes, even while kissing goodbye another unscheduled weekday night---we're down to only Thursdays now. Oh well, all for a good cause. I'm excited. Had my first stained glass tonight. The instructor, Jimmy, seems really nice, and also seems to really know his stuff. He says he's been doing stained glass for 15 years and teaching for most of that time. It sounds like it's his living, between repair work and commissions (in that order), teaching, and working in a stained glass supply store one day a week. Tonight was mostly talk. Which was fine, the extent of what I had known about stained glass can be summed up like this: "It's pretty." 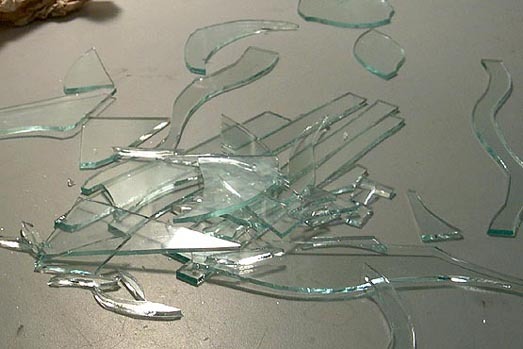 We did see some action toward the end of class, in the form of practice cutting and breaking on window glass. I won the "Golden Band-Aid Award" for drawing the first blood of the quarter, via an invisible glass splinter embedded in the ball of my thumb. Would that I had such success in the cutting itself: it seems that for me, applying enough pressure with the cutter to create a good score in the glass means I've got too much momentum to closely follow the pattern... or going slowly enough to closely follow the pattern means my score is much too weak, causing the glass to break incorrectly. I hope I'll get better; I felt somewhat discouraged by the time class was over. We are to pick out or design patterns in time for next week's class. Says Jimmy: "Most of the stained glass supply stores around here know me as the guy who lets his beginners do whatever they want." I expect I'll be designing my own, which will be an additional challenge because this class does not cover design---but finishing something I designed myself will be twice as sweet as finishing a project out of my book. There are ten students in my class. Three of us are smokers, a phenomenal percentage in such a small group... perhaps it's simply an overlap in the danger-seeking demographic. While enjoying a getting-to-know-you cigarette outside, I told my new classmates about my high school wood shop class. Most everyone else chose for a project a clock fashioned out of a polished cross-slice of tree trunk. I chose a wall-hutch, with spindles and shelves and drawers. In short, it was way too much. The project never did get finished---I ended up moving away suddenly before the semester was over but I don't think I'd've gotten it done in time anyway---I believe I took an Incomplete for the class. That should have taught me a lesson about what reward an overachiever can expect... but I don't think I learned a thing. That glass splinter I picked up Tuesday? Yeah... still there. In spite of my having soaked it in epsom salts and going at it with a needle. If I could have found the box of fresh blades for my X-acto knife, I'd've done that too. So now I have a chunk of glass and a hole in my thumb. You have no idea how much you use the ball of your thumb until it sends staggering bolts of pain up your forearm every time you do so. On the bright side, VH1 was showing The Godfather while all this was going on, which felt oddly thematically-appropriate. 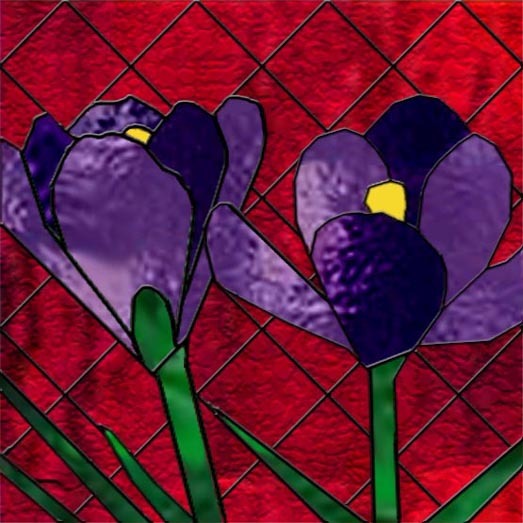 Pending a cutting-feasibility review from my instructor, this will be my lead-technique stained glass project for the quarter. I did it in Photoshop; very handy because I can have one layer for my color fills and another for the outlines and then just turn off the fill layer when it's time to print a cutting pattern. Fun trivia fact: "hot" colors of stained glass cost more per pound, because gold is what's used to achieve red tones in glass. It's my bad luck that I'm really, really fond of red. In other news, my glass splinter seems to've worked itself out. Perhaps it simply needed some time to recover from the trauma of being chased around with a hot needle, I don't know.